i like this post so much. 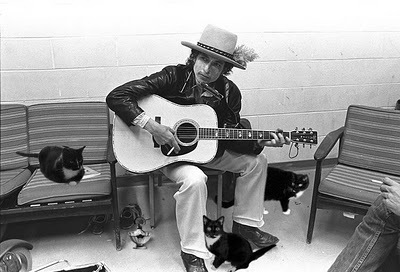 The black and white one to Bob’s left looks like my cat Chief. This is great! Those cats are clearly photoshopped in. That looks like he is holding the cig with his hand, not his leg, although if anyone could smoke a cigarette with their leg it would be the boss. Maybe it is this mythical “photoshop” you speak of striking again. I was always told that is not photoshop, but scary computer phantoms messing with beloved archived photos found in a simple google image search. I was such an IDIOT for not realizing! Dark, so people are idiots for assuming a picture hasn’t been photoshopped? Sorry that you are so angry. Rolling Thunder, backstage, November 1975. Source photograph for fake courtesy of Elsa Dorfman.